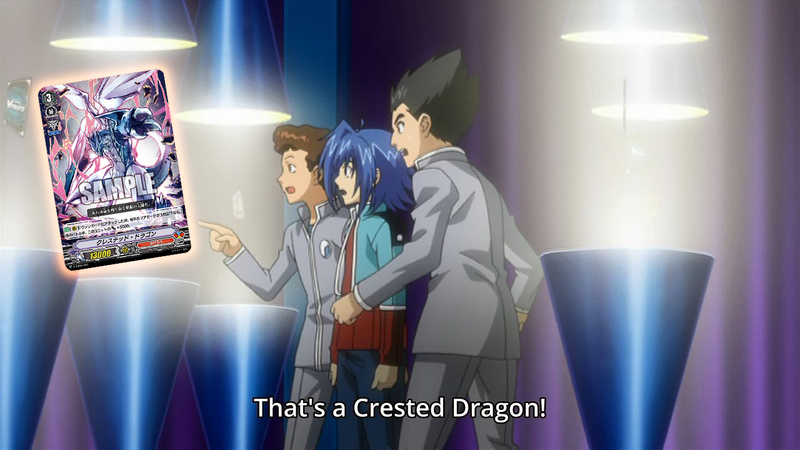 The Japanese cards of the day for April 27th are the supporting grade 3s from V-Trial Deck 01: Sendou Aichi and 02: Kai Toshiki, Stardrive Dragon and Crested Dragon. 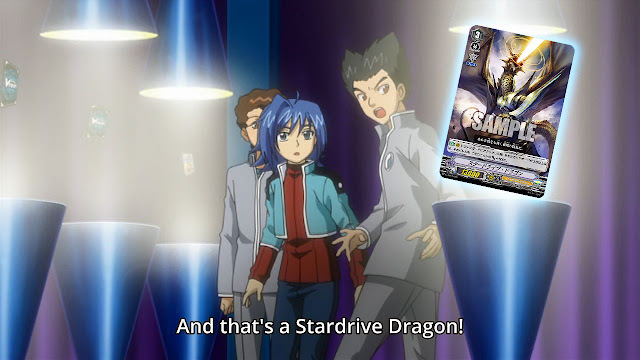 Longtime cardfighters will remember these from the Stardrive and Crested Flash Decks distributed prior to the game's actual launch in early 2011, and these cards have served much the same purpose in the rebooted Cardfight!! Vanguard as the headliners for the Start Decks distributed during the worldwide Demo Caravans. (To be held in June for the English format.) The Trial Deck versions of these cards differ significantly from their Start Deck counterparts, and both versions will be legal under the Standard rules, so which should you run? 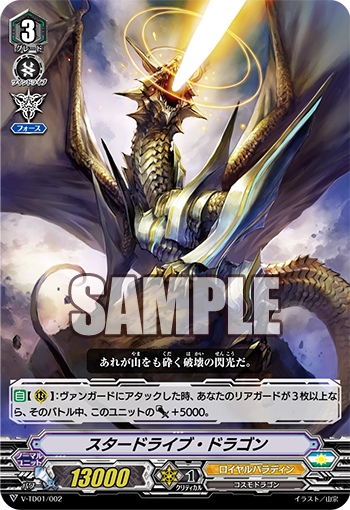 AUTO [Rearguard Circle]: When it attacks a vanguard, if the number of your opponent's rearguards is 3 or less, this unit gets Power +5000 until end of battle. AUTO [Rearguard Circle]: When it attacks a vanguard, if the number of your rearguards is 3 or greater, this unit gets Power +5000 until end of battle. 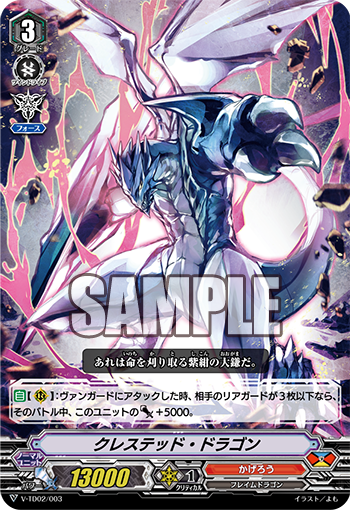 Appropriately for Royal Paladin and Kagerо̄, the new Stardrive and Crested Dragons are essentially inversions of each another's conditions, with Stardrive gaining power based on increasing your own rearguards and Crested gaining it based on reducing the opponent's. Their SD incarnations instead gained just 3k power, but those versions were active in both vanguard and rearguard circles, and both required their fighter to have three or more rearguards in play. The 5k power bonus means that the new cards can swing for 18 alone, which meets the base requirement to force the opponent to guard with 10k shield. (13 being the normal base power for a grade 3 vanguard in Standard.) With as low as a 5k boost these cards can go for 23k and force a guard with a Critical Trigger or better, but the problem is reaching the stage after 23. 28k is the threshold at which rearguard columns become truly threatening in the Standard format, and the only way for these cards to reach that threshold is with Allen, Marron, Gojo, or Auspice Falcon. These cards each have skills capable of powering up either themselves or these attackers, bringing them in the range of 28~29k. Without these specific units, there isn't a tangible difference between the SD and TD versions of these cards, as virtually any booster will make a 23 column with the Start Deck versions. No matter which version is your preference, they each have the Force icon, granting you another instance of a continuous +10k during your turn to a circle of your choice--for the rest of the game. That brings us to an important issue with these cards; they contradict the goals of your deck. In the new format, the ideal play strategy is to continuously ride another grade 3 every turn from the first moment possible, gaining another instance of your clan's Imaginary Gift to further strengthen your board and force additional guard from the opponent. (Or in the case of Protect, progressing another step on the long road towards an unbreakable defense.) Playing grade 3s with a Gift to the rearguard directly contradicts the ideal flow of Standard decks. Vortex Dragon and Gigantech Charger can get away with it because these cards don't have Force, and as a trade-off are capable of a much higher maximum threshold of power than Crested or Star Drive, with Vortex getting 5k every time you use Bahr, Burj, Berserk Dragon, or Spillover, and Gigantech getting 10k on-place or when you ride. 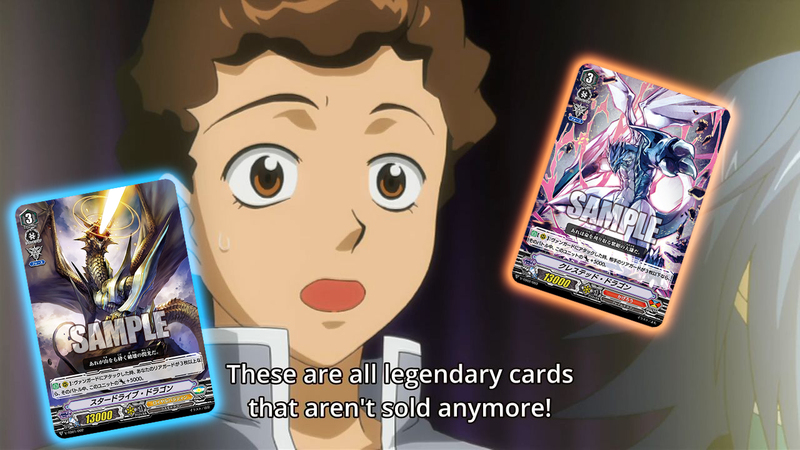 At the end of the day, the Start Deck vs Trial Deck version debate won't have long to live. The Trial Decks hit June 8th for the English format, and we move on to BT01 format just 22 days later. By then multiple new grade 3s will have likely swept all this under the rug. But for those 22 days, it's probably best to switch these units out for their Start Deck prints. With these two cards out of the way, we have one final set of uncertainties regarding the Trial Decks; whether or not the grade 1 perfect guards will differ from their Start Deck counterparts, and if any of the triggers will be effect triggers. The previous Japanese card of the day was Bellicosity Dragon.